As the temperatures drop to minus 5 degrees, you’ll be left hugging yourselves with chattering teeth in the snow zone. So, for your health and safety the right clothing and footwear is very essential to enter the snow area. Snow jacket, a pair of gloves, boots and earplugs will be provided to you during the gearing up time before you enter the snow zone! Visitors must ensure that they carry socks for themselves.For hygiene purposes, we at Imagica Snow Park take utmost care to wash and dry these garments and accessories after every session. Visitors should avoid wearing jewellery in the snow zone. Entitles holder to a single session of maximum 45 minutes to the Imagica Snow Park which includes access to the snow zone in operation on the day of your visit. This includes fee for shoes, gloves and jackets as well. All other in-park services like locker rentals, food and beverages consumed inside the park are charged on actuals. Tickets are non-transferable, non-exchangeable, non-refundable, non-redeemable for cash and non-replaceable if lost or stolen and will be void if altered. Re-entry to Imagica Snow Park is not permitted after you have made an exit from the snow park. May be revoked and the holder ejected from the park without refund if misused or if the holder violates the park policies, safety instructions, rules or regulations. For a full version of terms and conditions, as applicable, please ask the representative at the ticketing counter a review copy. Please read safety signs and follow the directions of the Imagica Snow Park staff at all times. Guests with any medical or health restrictions on their physical activity and pregnant ladies are not recommended inside the snow zone by the management. Standard sizes of jackets, gloves and snow boots will be provided to guests free of cost. These will have to be returned before exiting the snow park. Management allows but does not recommend personal jackets and boots. We suggest to wear socks before stepping the snow zone. Socks and leggings are available for sale inside the snow park. Management is not responsible for any loss of personal belongings of the guests. Limited locker on rental basis is available for your convenience. Please do not leave valuables unattended. Guests are advised to empty the lockers with care befoe handing the key to the management. Management is not responsible for items left behind in the lockers. Slides are body active, participatory activities. Such activities present a risk of injury. Unruly behavior and horseplay are not permitted. Children below 2 years of age are not allowed inside the snow area because of extremely low temperature.Children up to 12 years must be accompanied by an adult. 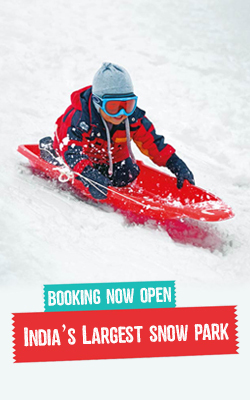 Management is not responsible for any injuries or accident occurring inside the premises of the snow park. Management reserves the right to stop taking picture or video recording. Loose items such as neck, wrist and hand jewellery, watches, glasses, cameras, phones, hats, keys and purses etc. For your own health and safety, appropriate snow wear must be worn at all times when inside the snow zone and if wearing inappropriate attire, you might be asked to change or leave the premises. Appropriate jackets, gloves, and boots will be provided with each admission on returnable basis and which must be worn whilst inside the park. You may buy appropriate socks and/or leggings from our retail outlets.